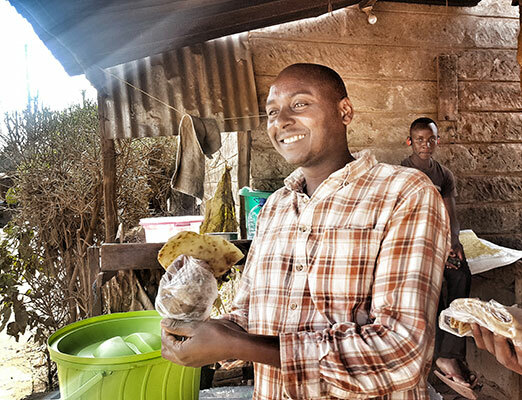 “ I am Nicholas Nzioko a local Chapati Business seller in Rongai, I started the business with the purpose of making profit during customer low turn up time since I was employed as a local sales clerk. I bought baking flour and cooking oil and started cooking chapatis and selling them at Ksh 10 each outside the shop that I was employed in. My business started flourishing and i made good profit. One of my regular customers Mr. Bernard Kipkurui whom I never knew worked for Premier Credit Kenya asked me about my business and the reason to why I decided to sell chapatis and I opened it up to him and he liked my idea of setting up the business and he asked me if I would need a loan to help me boost my business and I accepted the offer and he helped me get a loan of Ksh 10,000 to boost my business. The loan helped me much and from buying one packet of baking flour I started buying six packets which increased my production since the demand had increased and my profit grew.